Led by internationally-famous evangelists Moody and Sankey, the revival business of the late 19th century was an established juggernaut, complete with its own musical soundtrack. It met up with an infant recording industry in the 1890s still experiencing growing pains. 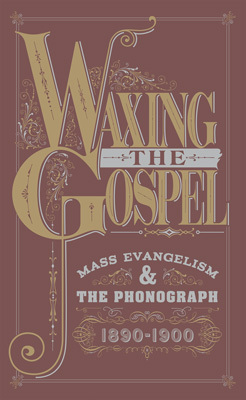 Waxing the Gospel is a groundbreaking exploration of how tradition and technology merged in three distinct areas of recording: commercial, celebrity, and vernacular. Waxing the Gospel presents top-notch performances by the earliest studio pros, records by Moody and Sankey themselves, and debuts more than a dozen sacred treasures made in the parlors of ordinary people experimenting with their own phonographs. We chronicle our incredible detective hunt that identified a cache of mystery “homemade” cylinders as actually being field recordings from 1897, taken at the annual Methodist camp meeting at Ocean Grove, New Jersey. 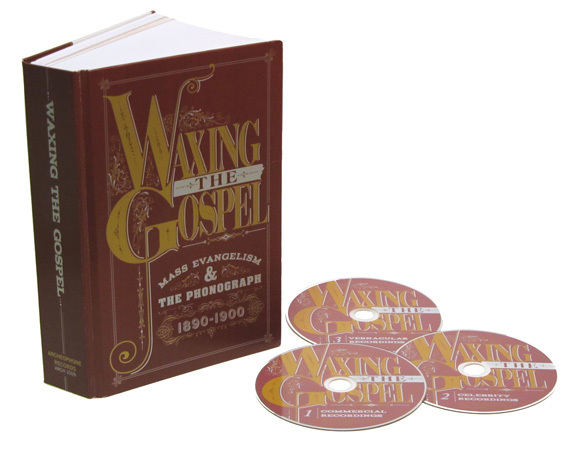 With 102 tracks on three CDs, enclosed in a beautifully-illustrated 6″ by 9″ hardback book, Waxing the Gospel is the most in-depth and authoritative exploration of the first decade of the phonograph ever published. The emergence of the sacred repertoire is the lens through which we make our examination, but this set is as much about brown wax cylinder records as it is about the pioneering work of evangelists Dwight L. Moody and Ira D. Sankey. It is so amazing that we actually get to hear the songs and the singers that have truly been the forerunners of Christian music. It’s almost like we’ve traveled back into their time and can hear all the history and heritage that’s been captured. I’m so excited about this project! To be able to listen to some of the oldest and rarest recordings of our Christian heritage is incredible! I wasn’t really prepared for what I was about to hear, expecting ancient sounds that were virtually irrelevant to what the church looks and sounds like today. What I got was people singing and preaching the very same gospel we sing and preach about today. In a time when opinions and beliefs change about as much as we change our socks, the Gospel has remained steadfast! Simply put, “Waxing the Gospel” reminds us that we truly worship a God who is . . . was . . . and always will be. “A window in time” . . . Those words occurred to me as I listened to this well-researched and beautifully mastered set of recordings from over a century ago. What a thrill to hear such bedrock hymns of the Christian faith being “waxed” at the dawn of the American recording industry! An added bonus is hearing the voice of Fanny Crosby reading one of her poems and Ira D. Sankey singing some of his own hymn compositions—truly incredible moments in a collection ALREADY filled with incredible moments! I have been singing gospel songs in public since I was three years old. You cannot imagine how thrilled I was to hear these wonderful songs by the very people who wrote them! I am indebted to the folks who made this collection available because it is absolutely soul stirring to hear these recordings! This is an important cultural treasure and, dare I say, a spiritual one also. Perhaps one reason contemporary Christian music has lost its way is because we’ve forgotten where we came from. This remarkable collection is a clear window into that past. The recording by Fanny Crosby alone is worth the price. Having sung Fanny Crosby’s gospel songs for all of my life, I was stunned to hear her voice reading a poem. It was her voice which somehow reaffirmed my love for her music. All of those pioneers of the music from our faith traditions became relevant to me. The contemporary brain is stirred as the soul takes comfort of those blessed assurances. What a powerful expression of modern technology and the thoughtful people at Archeophone Records who have saved this history by preserving these pioneers’ recordings! It is a treasure to have.